Today, a man runs to Jesus and seeks an answer to life’s deepest question. Yet this did not end well. Why? St. Mark describes for us an unforgettable exchange Jesus had with a man who earnestly seeks Him out. The man “ran” up to Him and “knelt down before Him.” When we hear the man’s question (“Good teacher, what must I do to inherit eternal life?”), we have to be impressed with his honest seriousness. This man has a burning desire for spiritual truth, and he expects Jesus to reveal it. Are we surprised by Jesus’ response? The man has just opened the door of his life to hearing the Good News Jesus came to preach, but, instead, Jesus asks, “Why do you call Me good? No one is good but God alone.” What could have prompted this? We know this isn’t a case of false humility in Jesus. We know He isn’t disavowing His deity. 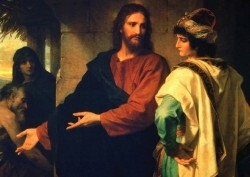 So, we have to conclude that, at the very outset, Jesus sees something in the man that suggests he does not fully understand the identity of this “good teacher.” Jesus wants the man to know Him as He truly is—He is seeking to establish a personal relationship with him and not simply to supply him with religious knowledge. Then, as if to emphasize this man’s need, Jesus repeats some of the Ten Commandments. Every Jew knew that the Commandments were God’s path to true life. Was the man a bit disappointed with the direction of this conversation? “Teacher, all these I have observed from my youth.” Nothing new here, teacher. Then comes the moment when everything changes, the moment for which the man had approached Jesus so eagerly in the first place. “Jesus, looking at him, loved him.” No longer is this a search for information by this man. Jesus looks at him with love. The man has arrived at the place he needs to be in order to truly hear what Jesus has to say. He has acknowledged that observance of the Law has somehow not been enough to satisfy his longing for eternal life. He knows that something is missing. Jesus loves his honesty and humility. This man is not ashamed to admit his emptiness. It didn’t work! This man, for whom there seems so much promise for conversion and discipleship, misses his moment. The thought of letting go of his possessions was too much. What did he expect Jesus to say when he inquired about eternal life? Did he think it would be another obligation? Was it going to be more almsgiving or fasting or prayer? Surely this man was prepared for any of those instructions. Yet Jesus knew that what he was seeking was not another religious requirement but Divine Love, and that kind of love requires single-hearted devotion. There isn’t enough room in any man’s heart for love of God and love of money. Jesus tries to woo him into this Love by assuring him of a much greater treasure than his earthly possessions, kept safe for him in heaven. Instead of rousing him to joy, however, these words make the man “sad.” We might wonder what caused this sadness. Was the man sad because he couldn’t part with his possessions and thus was not able to “inherit eternal life”? Was he sad because he was disappointed in the “good teacher,” from whom he expected more? Jesus was deeply affected by this encounter. He “looked around” to His disciples and told them several times how hard it is for the rich to enter the kingdom of heaven. The disciples were amazed at this, because they, like all Jews, believed that material possessions were a sign of God’s blessing on good people. Surely the good people should be the first to enter the Kingdom! If that’s not the case, then “who can be saved?” Jesus answers so simply. “For human beings it is impossible, but not for God. All things are possible for God.” Even good people are utterly dependent on God for salvation. Human beings cannot save themselves, even the best of us. That is why Jesus didn’t give the rich man yet another obligation. No amount of good work can save us. No one can be a true disciple without understanding that. It is interesting to see Peter remind Jesus that His disciples had given up everything to follow Him. Was this bragging? Or was it, instead, Peter’s heartfelt attempt to comfort Jesus after what must have been a painful loss, as He watched the man He loved go away sad? Jesus assures them that their lives will be rewarded as a result of their renunciation. He doesn’t promise them “a hundred times” more in earthly possessions, of course. They will receive the eternal reality of what possessions can only temporarily provide—security, familial love, a home. Included in their “treasure” will be “persecutions,” thus confirming them in the fullness of Jesus’ life in them (“blessed are you when men persecute you”—see Mt 5:11-12). In their emptiness, their lives will be full. Here is a beautiful, poetic description of how spiritual gifts are far more valuable than riches. In this case, the author “prayed, and prudence [wisdom] was given” him. He extols the priceless worth of this gift; he “deemed riches nothing in comparison with her.” In the Gospel, Jesus tried to break through to the rich man with a vision of this kind of wisdom—one that sees responding to God’s call as making “all gold…a little sand” and “silver…to be accounted as mire.” Here, the author recognizes that although the gift of wisdom is greater than the good things money can buy, “yet all good things together came to me in her company, and countless riches at her hand.” This is the paradox of those who have given up everything for the Kingdom of God. As St. Paul says, “We are treated…as having nothing, and yet possessing everything” (2 Cor. 6:8b, 10b). Possible response: Lord, forgive me for the ways in which I seek security in money rather than in You. This is a splendid reading for us today! Our other Scriptures are probing our hearts (as Jesus probed the heart of the rich man in the Gospel), and we should be sure to let them do their work on us. All of us, by nature, love possessions. None of us, by nature, want to be separated from them. The author of Hebrews reminds us of the power of God’s Word. It is “living and effective…able to discern reflections and thoughts of the heart.” Notice that the Word of God is called “Him.” We see that the “Word of God” is being used in an expansive way, to include both Scripture and Jesus. He is the Living Word of God Who came down from heaven and Who is present in His Word and the sacraments. He is the One “to whom we must render an account.” What better incentive could we have than this to listen carefully to all that He is saying today? Possible response: Heavenly Father, I can get uncomfortable reading and hearing the Scriptures about money. Help me not squirm away from their searing surgery.